These online Alaska Seas and Watersheds teaching activities, developed by Alaska teachers, provide high-quality lesson plans and units for use by teachers and homeschoolers, as well as interpreters, youth groups, nature tour guides, and anyone seeking fascinating content on marine and associated watershed science topics. The lesson plans and units are complete and ready to use, aligned with Alaska state science standards, and include curricular connections to mathematics, English and Language Arts (ELA), art, and social studies; and teaching activities aligned with the Next Generation Science Standards and Alaska Math and ELA standards have been recently added. Four units in the Grade 8 curriculum—Investigation 1, Ch-ch-ch-changes; Investigation 2, Impacts of Change in Glacier Ice; Investigation 3: Bering Sea Expedition; and Investigation 4, Changes in Our Local Environment—have undergone rigorous review and been selected as outstanding educational resources by the NSF-funded Climate Literacy and Energy Awareness Network (CLEAN). Alaska Seas and Watersheds teaching resources and activity ideas for field trips and stewardship projects are available for all grade levels along with new NGSS-aligned lesson plans and units for field trips and the use of drones and submersibles to collect environmental data. A collection of teaching resources for the Northern Gulf of Alaska Long-Term Ecological Research Project area and a link to resources for teaching about ocean acidification. Alaska Sea Grant provides professional development in a variety of formats. Onsite in-service presentations and workshops are provided free-of-charge as an opportunity for Alaska K-8 teachers and informal educators to learn about our award-winning, Alaska-relevant curriculum materials and other educational resources. Graduate-level courses can also be provided for the cost of Continuing Education Credits through the University of Alaska. Since its beginnings during the 2014-2015 school year, the Alaska Sea Grant school grant program has provided more than $100,000 to 10 Alaska school districts to increase local marine and aquatic education in 22 communities. The three-year, $10,000 grants have supported science curriculum revisions, development of NGSS-aligned lesson plans and units, field trip transportation, and the purchase of equipment and supplies. If you are an Alaska teacher or administrator, contact us to get on the email list for the next announcement for a Request for Proposals. Students explore and collect data in Westchester Lagoon, the outlet to Chester Creek. 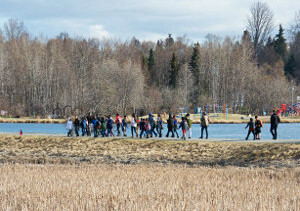 Alaska Sea Grant funds support a watershed education field trip program for more than 250 Anchorage School District students. Photographs courtesy of Reid Brewer, Verena Gill, Heloise Chenelot, Stephen Trumble, and David Menke. The contents of this website were developed with the assistance of Title II, Part B, Mathematics and Science Partnership Program federal funds from the Alaska Department of Education & Early Development. However, these contents do not necessarily represent the policy of the Department of Education & Early Development, and you should not assume endorsement by the Federal Government.